5805 N. W. 50th St. 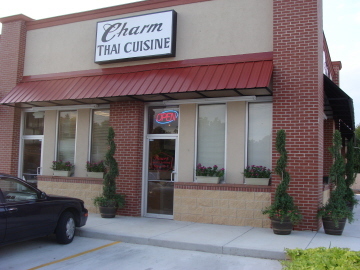 Charm Thai Cuisine may very well be the best Thai restaurant in the Oklahoma City area. 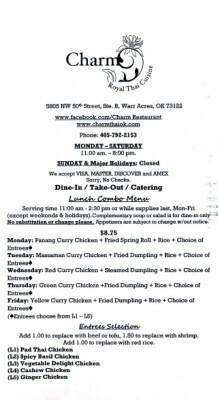 There are certainly some worthy competitors, and other restaurants I have not tried, but I have yet to find anything at Charm Thai that I can really say is disappointing. 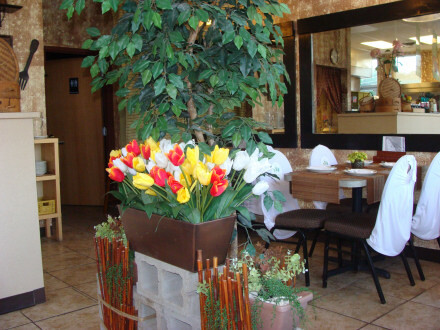 At the beginning of 2013 Charm Thai had a change of ownership, and I think the new owners have made a good restaurant even better. Some of the dishes reviewed here were from the “old” restaurant, and I will make note of this, but my opinion is that there was not a drastic change in the restaurant after the ownership change. 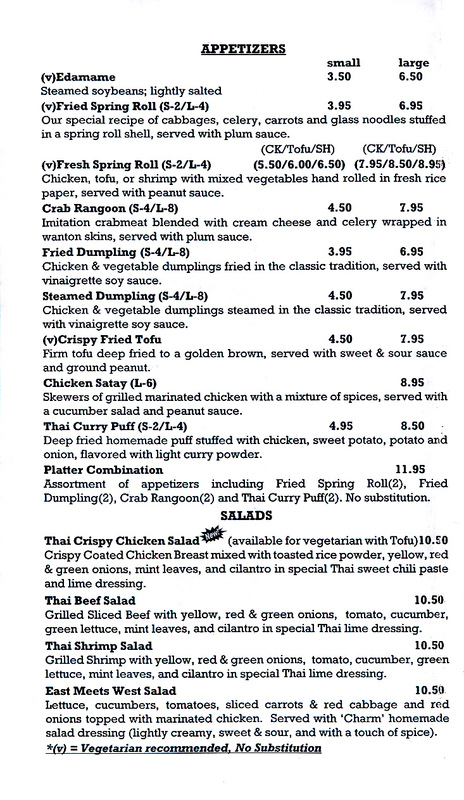 I think some of the more Americanized dishes were eliminated in 2013, although for the most part I did not notice much change in the items served or the flavors. 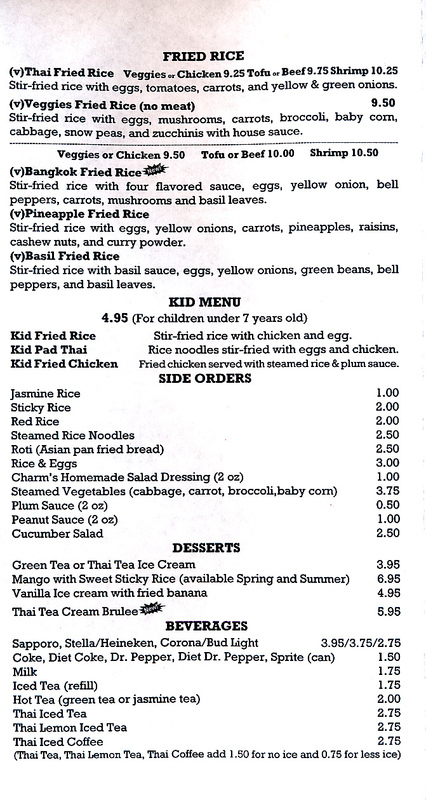 Most notably there was a dish called pad preaw wan (sweet and sour) which I can no longer find on the menu that might be called a more Americanized dish (but if it is in fact a Thai dish, it is one which the new owners apparently have chosen not to offer). This is a small restaurant that I have seen crowded but never so full that the tables are completely occupied. I expect occasional waits at “mom and pop” restaurants, though, as the tradeoff for the type of home style food they prepare. 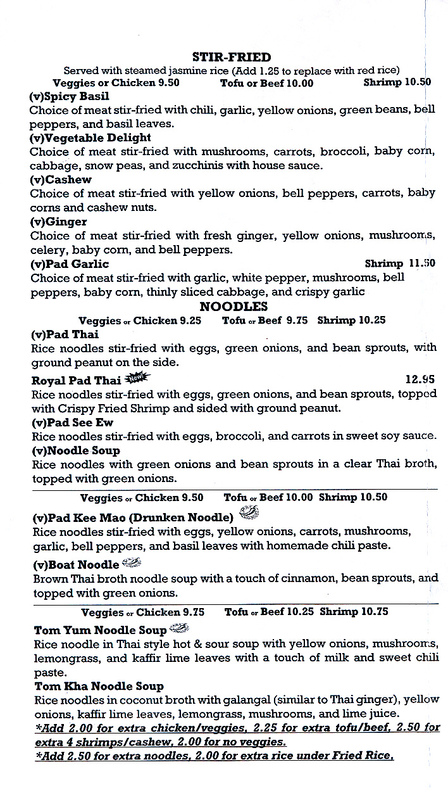 Lunch specials on Monday through Friday are a “Lunch Combo Menu” which has the same five choices for an entree selection every day (pad thai, spicy basil, vegetables, cashew, or ginger). 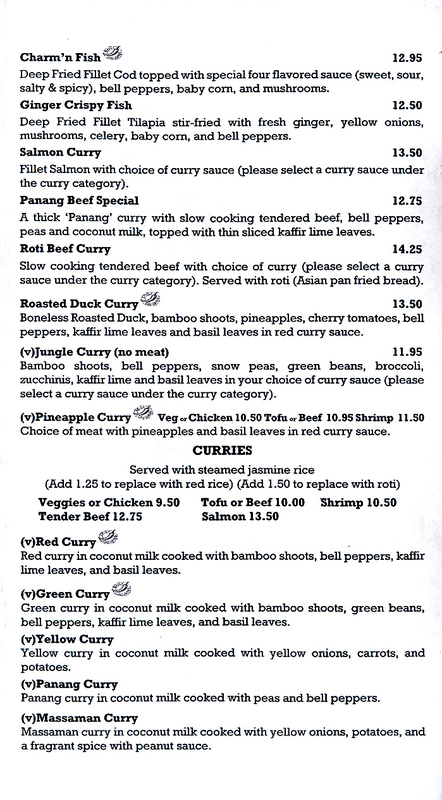 The type of curry served with it is different every day, and the choice of dumpling or spring roll also changes. 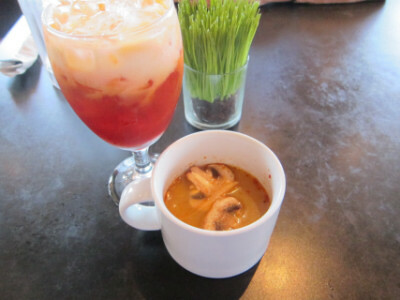 You also get a complementary bowl of soup as an appetizer. 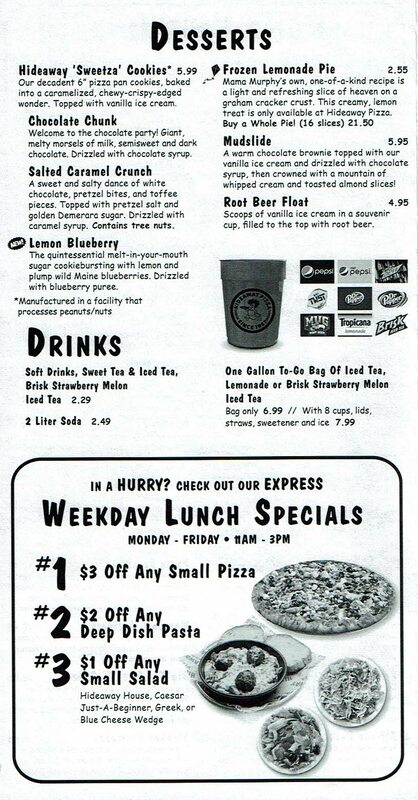 I generally think the lunches are a very good deal, although it is not as much a matter of saving much money as it is that you get a variety of different items. The Vegetable Soup served with the lunch combos is probably my favorite because of its sour flavor component that makes is somewhat like hot and sour soup but without the “hot” part. Chicken Soup is another of the ones served with the lunch combo. This one was good because of the mushrooms that were included. 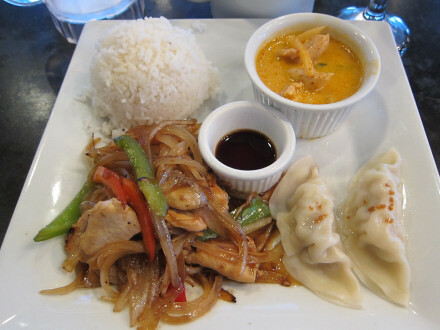 Yellow Curry is probably my favorite of the curries served here, and it is included in the lunch combo on Fridays. Surprisingly the curry was less spicy than the soup served on this day (chicken soup) but none of the food served for lunch is “Thai spicy,” and you do not seem to get a choice about how spicy they prepare the lunches (this would be different if you ordered from the regular menu). 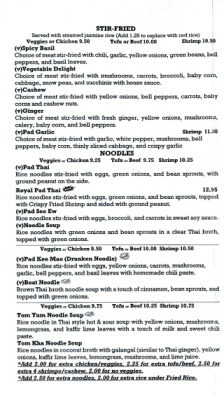 The main item (pad thai) is totally optional, and is one of the five entree selections that are available. 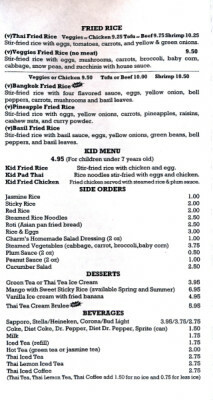 In addition you can choose the default chicken or get tofu, beef, or shrimp for an extra charge. 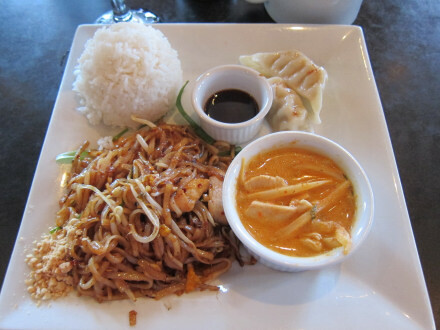 I generally consider that Tana Thai has the best Pad Thai in town, and I made a note that the one at Charm Thai was sweeter and had a more complex flavor. This is both good (the complex flavor) and bad (the sweeter flavor) so I am not sure which one is actually better, but I am sure that I like them both. The Ginger Chicken for lunch is much like the ginger stir-fry from the regular menu except that it comes non-spicy by default. 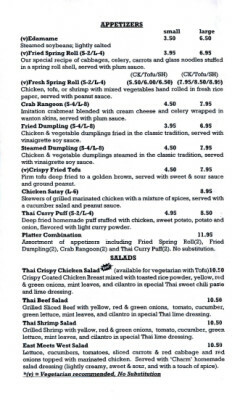 Chicken is also the default although you can get it with other meats or no meat (tofu) for an extra charge. 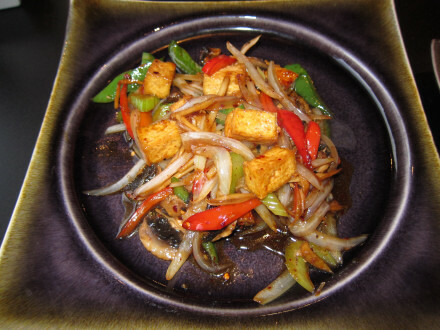 The Ginger Stir Fry (pad khing) is always one of my favorite dishes, and the one here lived up to my expectations. The sauce was flavorful and it had a good balance of flavors. The biggest negative of the dish is the vegetables that are included, although it does have some good mushrooms. I would say go ahead and order it–the tofu or meat that comes with it will make it satisfying. 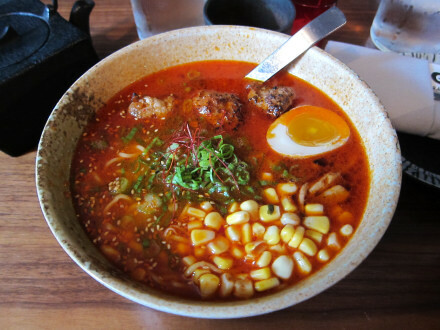 I also prefer the dinner over the lunch version because I can choose a higher spice level (although the time I ordered it for lunch I did not ask if the spice level can be adjusted). 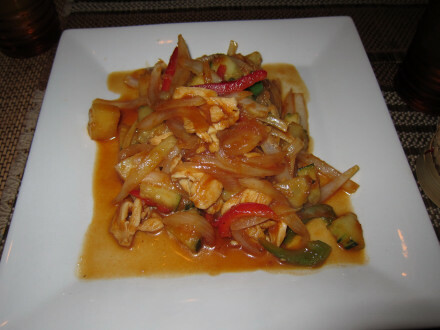 To me an even better dish is the Pad Prik Khing, usually my yardstick for measuring the food at Thai restaurants. In this case it was very good, with the green beans being fresh and crunchy (and there were a lot of them). The curry paste (curry without the coconut milk) was very flavorful, and this dish definitely had everything I expected. Curry Delight was a dish from before 2013 that I enjoyed, but not so much that I was disappointed to see it dropped from the menu. 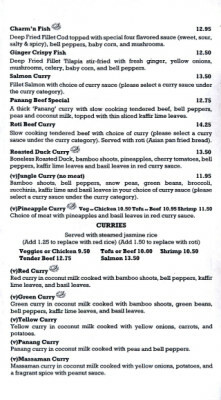 It was high in flavor, but I am not sure what type of curry was used (and the current menu has several types of curry). 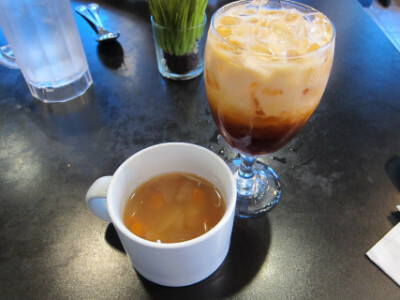 Pad Preaw Wan was a Thai style sweet and sour dish from the old menu, and contained both of these flavors (as opposed to the more common sauces which are just sweet). I am not sure whether or not a similar dish is available at present. 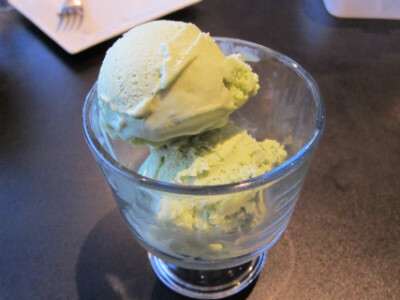 Green Tea Ice Cream makes a good aftercourse to a spicy meal, or just a better than average dish of ice cream. 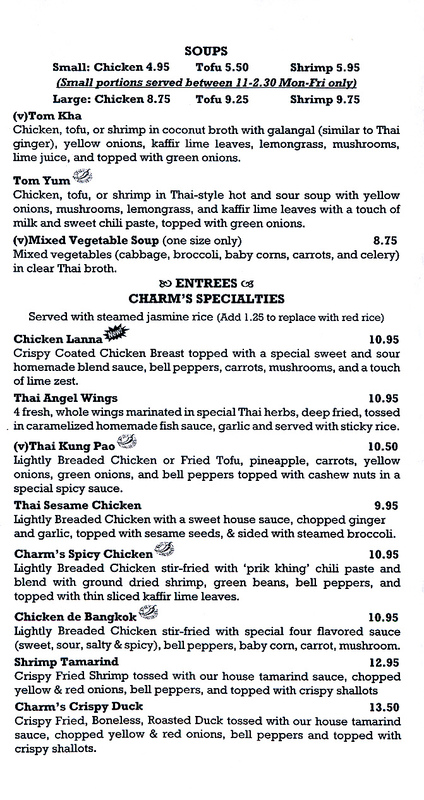 The menu at Charm Thai is fairly limited, which would be a negative except for the fact that I can always find something I like. The restaurant is small, but I have never been left to wait for a table to become available. Some dishes have smaller than average portion sizes, but this corrects a major flaw I find at many restaurants where they serve oversized plates (and at Charm Thai you might want to order extra rice if the dinners are not filling enough). 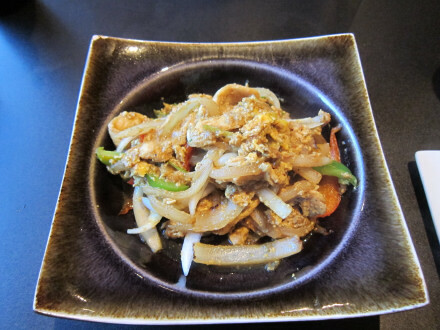 My favorite Thai dishes are usually ginger stir-fry and pad prik khing, and at Charm Thai these are both excellent (and perhaps the best in the city). The restaurant always asks me to choose my own spice level on the dinners. This is probably a positive because the lunches (which have the default level) are mostly not spicy enough for my taste. It is definitely a positive that when I order a certain spice level the food comes out very close to what I had expected. Of course the main reason to come here is the excellent flavor of the food. 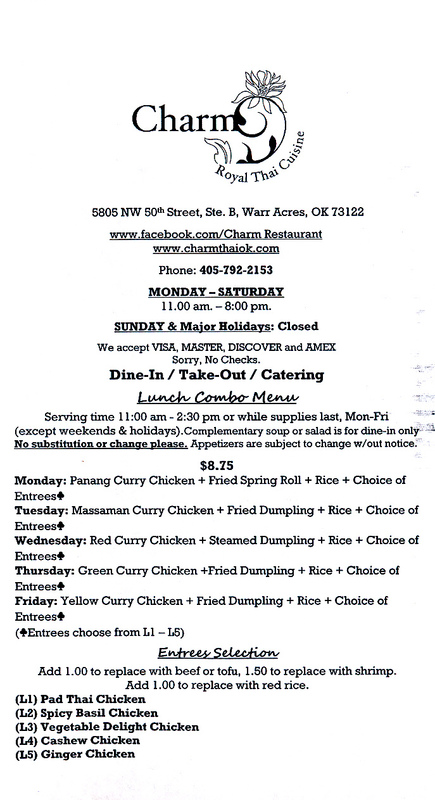 I think other Thai restaurants deliver quality food as well, but few are as consistent with all items on the menu as Charm Thai. 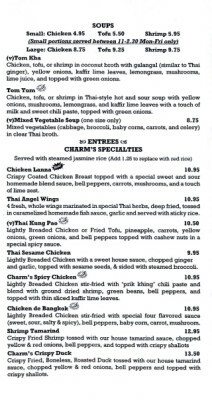 The food here is also free from MSG, which contradicts the notion that it should be added as a flavor enhancer (I do not know how the food could be much more flavorful than it is at Charm Thai). 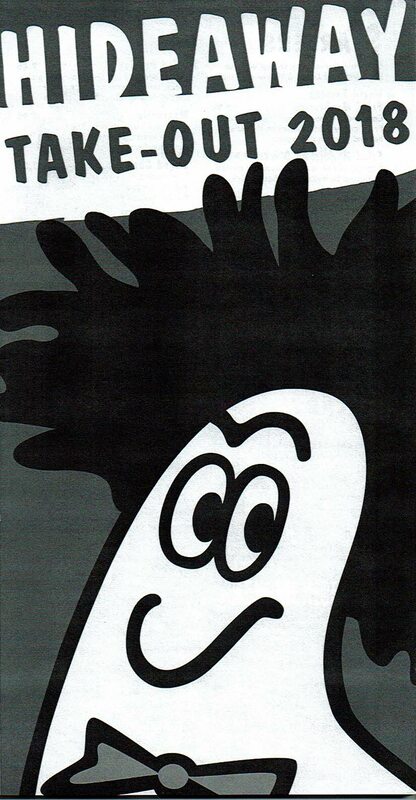 “Hideaway No. 2” seems to fit firmly into the category of “chaindom” with its ever-growing number of locations. I think this sometimes involves some negatives, such as the way they changed the menu in 2015, deleting a number of items. This was probably done for efficiency in operating all of their restaurants, but it has had a negative effect on my experience here. For instance, I did not realize the menu had been changed and I accidentally ordered the wrong margherita pizza, not knowing that the one I usually ordered (the “Old World”) had been deleted from the menu. They told me after the fact that if you want to order one of the “old” pizzas you can do so, but this requires knowing what they are. It turns out, though, that this only applies to the toppings. The margherita does not have the same kind of cheese as before, and ordering the old version only means that it will have red sauce (although admittedly this is not an insignificant point). 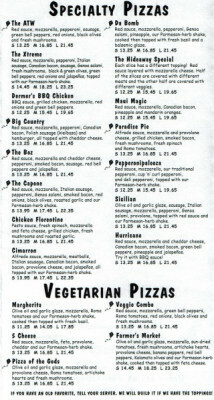 The menu still has a good variety of pizzas, including “Build Your Own.” They also have sandwiches and pasta dishes. Some of the salads are good, and this is another reason I like the restaurant overall. For me it is only lacking the one pizza I came to enjoy the most. 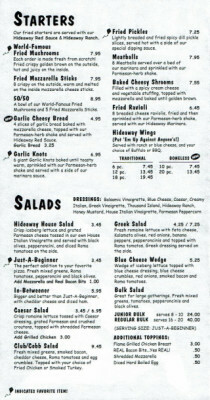 Surprisingly, I have found that the salad is one reason I like to come back despite the menu change. The Just-A-Beginner Salad is simple but quite fresh and enjoyable. I had gone to Ingrid’s one time where the meal came with a salad that I thought was much better than Hideaway’s, and it made me wonder why I thought the one here was so good. 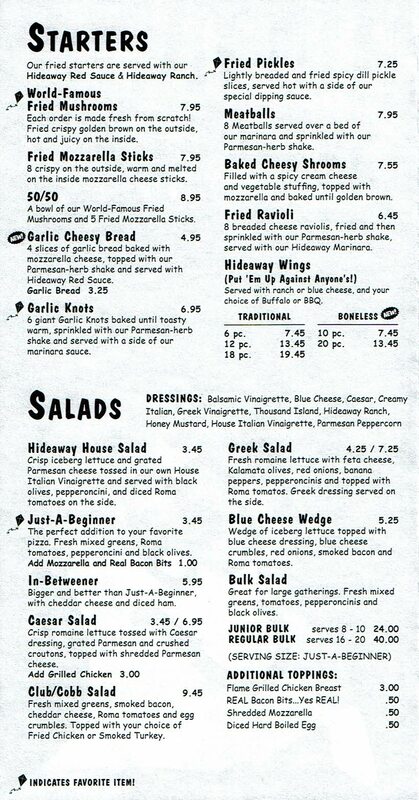 At numerous other restaurants, though, I keep thinking of Hideaway as having a better salad than the one they serve, and I still think of Hideaway’s as being quite good in the larger scheme of things. 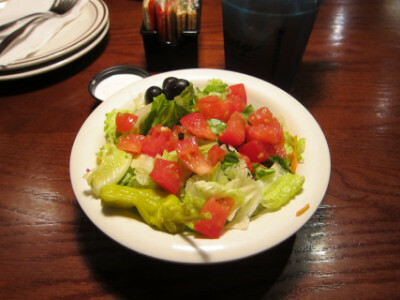 I will have to say that in contrast, though, the Greek Salad was disappointing to me with a dressing that was very tart, and a salad that seemed to be a little skimpy for the money you pay. I do not think Hideaway is known for its vegetarian pizzas, and there is not a large selection, but the one I almost always crave is the Margherita Pizza. Like all the pizzas here, you get a choice of the size and crust you want, but otherwise it is very straightforward. 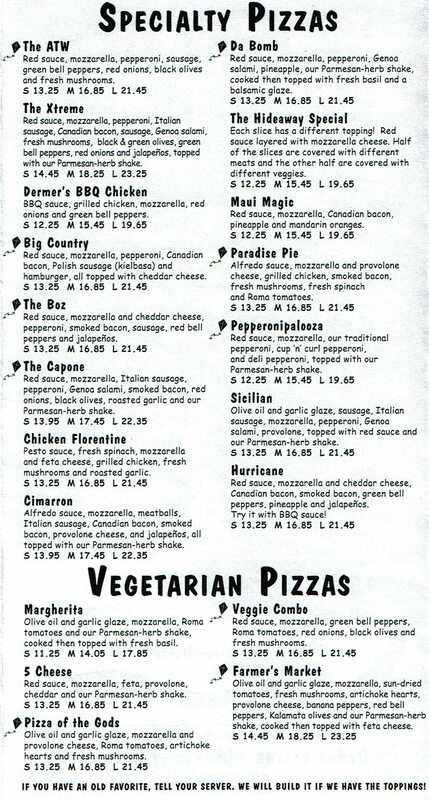 The twist, though, is that they used to have two versions of the margherita, and one was taken off the menu while the other was modified. The new version has an olive oil and garlic glaze, but I ask for one with red sauce instead. What I many times forget (and forgot when I ordered the one pictured) is that you can also ask for sun dried tomatoes instead of the Roma tomatoes which are normally included with the pizza. All of the versions I have tried have included fresh basil. I am disappointed that the pizza no longer has fresh mozzarella as it did on the old menu, but it still has several good features. The basil and red sauce are very enjoyable, and when I can remember to order the sun-dried tomatoes I like these as well. The cheese is good (but not as good as before). The crust is average (but is the same as on all the other pizzas). 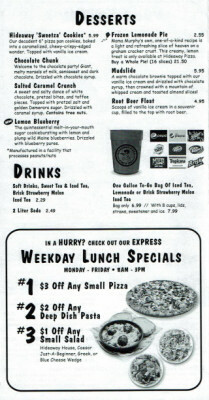 Most of the “Specialty Pizzas” differ only in the toppings they include, although a few have a sauce other than the red sauce. 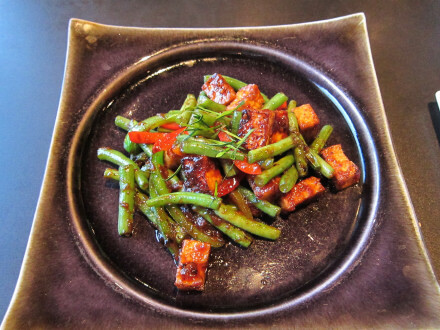 The ATW (which stands for Around the World) is probably appropriately named because it is mostly people in other parts of the world that eat as many vegetables as are included here. In addition to this it has pepperoni and sausage (two of my favorite meat toppings), and all around I think this is a good choice. 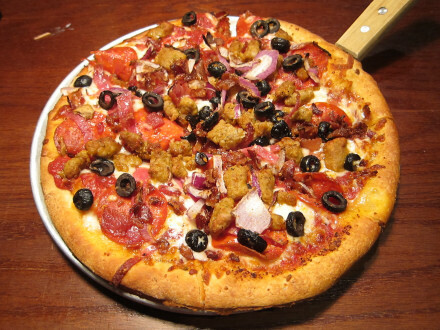 The Capone is a meat pizza that has enough vegetables (mainly black olives) to give it an interesting flavor. 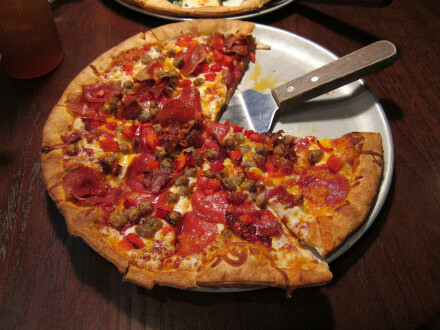 This is a meat lover’s pie, though, with Italian sausage, pepperoni, Genoa salami, and smoked bacon. The pizza pictured here was rather skimpy with the red sauce, but they gave me some extra sauce on the side which I think made it better (not that it really needed a lot of improvement). 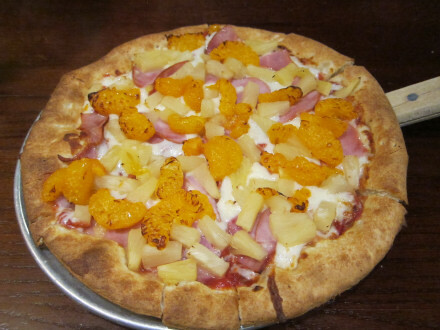 The Maui Magic includes red sauce, Canadian bacon, pineapple, and Mandarin orange slices. I would say the best part of this is the bacon (and of course the red sauce). The rest of it is really too non-traditional for my taste in pizzas. The Sicilian was lacking any vegetables, but I thought the meats were very good (sausage, Italian sausage, pepperoni, and Genoa salami. 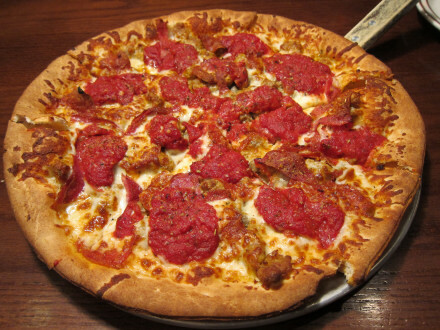 The Boz” is a good example of how satisfying the meat pizzas can be at Hideaway. 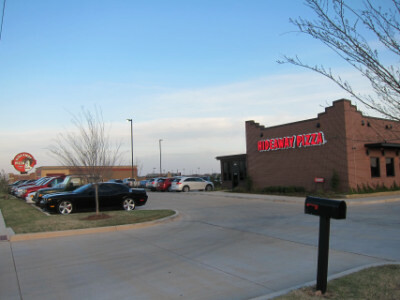 Named for University of Oklahoma football star Brian Bosworth, I suppose it is natural for this pizza to be loaded with different types of meat. The amount of bacon, pepperoni, and sausage they pile on this pizza may in fact have led to a pork shortage contributing to Divine Swine’s going out of business (OK, I admit this may be a stretch, but this pizza does have a lot of meat!). I liked it quite a bit, and I also liked the fact that the flavor of the red sauce came through to supply a contrast to the meat. I made a note that some thought had gone into the flavor combination of this pizza because it seemed to be one that worked very well. The one I tried was without the jalapeno (I think I was the only one at the table who would have wanted to include it). Even without this additional flavor, though, it was still good. The Hideaway Special gives you eight pizzas in one, with each slice being a different flavor (I think you get ten if you order the large pizza). The problem, though, is that most of the slices had a plain and one-dimensional flavor to me, and I think most of them come from the “Build Your Own” section of the menu where you just get cheese, sauce, and whatever topping you choose. I would definitely suggest getting a “Specialty Pizza” instead, where the combination of ingredients have been thoroughly taste tested. 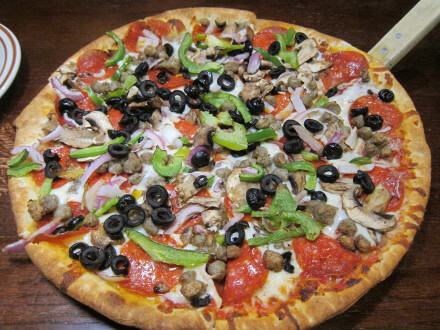 There is a choice of crust with all pizzas–hand tossed (thick), thin crust, or cracker crust. I thnk the thin crust best, but none of them are a standout in my opinion. A waitress told me that the thin crust has more sugar than the hand tossed (I think so it will cook better). The cracker crust is the original one used in the Stillwater restaurant, but for me it just does not add to the taste of the pizza (plus it is gluten free and they charge extra for it). I have enjoyed some of the pizzas that did not have red sauce, but my favorite pizzas are all ones that have the sauce. Most of the time it is the sauce, more than the toppings, crust, or cheese, that make this a place I want to come when I just want to have a good tasting meal regardless of the nutritional value or the calories. 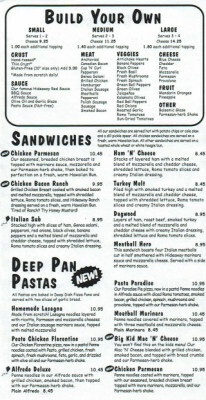 One of the down sides of the menu is that I find a lot of combinations that I just do not want to order. 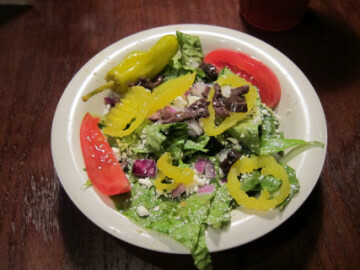 For instance, the Sicilian would probably be better with vegetables. 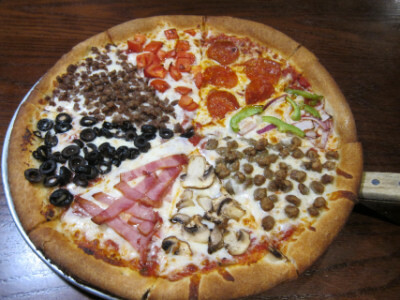 Many other pizzas have three or four good meat toppings but one or two I either do not like or do not want on a pizza. When you “build your own” the pizza ends up costing more than if you get the same toppings on a combination pizza. I do like some of the specialty pizzas, but there is not much flexibility in building your own. With so many locations, there are bound to be some differences at the different restaurants. 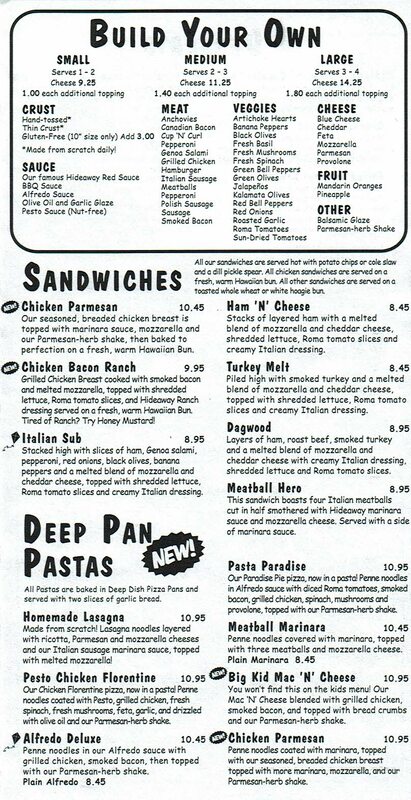 I know they all have the same menu, but I have kept returning to the Memorial Road location because they have helped me find the combinations I like and make modifications where possible. 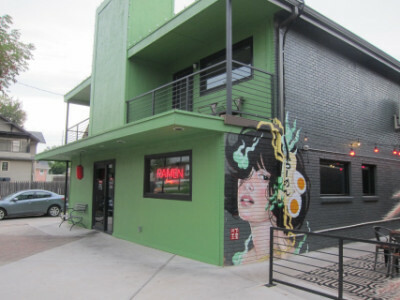 The seating is more comfortable that at the Northwest Expressway location where I originally had been going, and all around I have thought that the Memorial Road restaurant is a good location.